Call us for relief of back pain or neck pain! Offering comprehensive back and neck pain treatments! 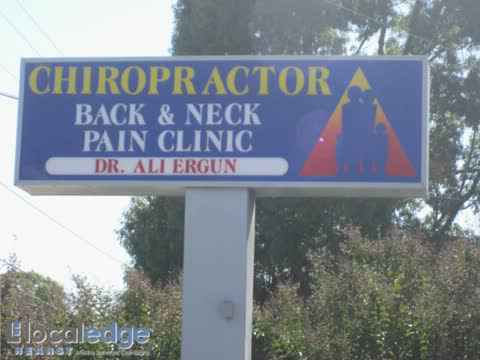 Dr. Ali Ergun and the staff at Back & Neck Pain Clinic are dedicated to improving your quality of life by providing chiropractic care for neck, back, arm and leg pain caused by an injury. Our staff will take the time to assess your injury and provide a care plan that will provide long lasting relief of back pain or neck pain. The team has the experience to help you get relief from you neck or back injury. Our team has been proudly serving Fayetteville, NC, Fort Bragg, NC, and the surrounding areas for over 15 years. Suffering from persistent pain in your neck? Our state-of-the-art facility is equipped with the latest diagnostic tools in aiding proper detection of the causes of your neck and back pain problems. We use advanced chiropractic treatments to help you get immediate relief from your neck pain which has been caused by an injury or spasm or any other reason. We serve patients in Fayetteville, NC and the surrounding areas. For quality neck pain treatment, make an appointment with our professionals today. We will work with your insurance company to insure you get the treatment that you deserve. Our staff will be at your service throughout your treatment to provide answers to questions about your injury or pain. If you’re in pain don’t wait another minute, call the Back & Neck Pain Clinic and schedule a free consultation today! According to the American Chiropractors Association, a chiropractor is a medical professional that can diagnose as well as treat disorders of the nervous and skeletal system. The utilize test methods for diagnosing such as MRI's and X-rays. They also use chiropractic techniques to manipulate joints of the body. Chiropractors choose not to prescribe medications, and most do not perform surgery but work closely with other doctors and they refer patients only when necessary. A chiropractor develops a treatment plan that relies heavily on the patient taking good care of their injury and learning how to aid in the healing process. Chiropractors share the belief that the main cause of pain and disease is due to the misalignment of vertebrae of the spinal column. They usually rely on the detection of misalignment by palpating or applying pressure to find pproblem areas. Chiropractors also use adjustments to relieve pressure and irritation and restore joint mobility. Spinal Decompression is an advanced, state-of-the-art, painless therapy for treating serious low back problems without surgery. The treatment is not only painless, but is in fact quite comfortable and relaxing as well. The technique creates a "pumping" effect on the intervertebral disks which relieves pressure and irritation on the spinal nerves. The result is a noticeable increase in the height of the involved disks, therefore making more room for the spinal nerves. Auto accidents are a leading cause for back pain and neck pain. During an accident your body withstands extreme force, which can lead to problems with bones and joints. Whiplash is commonly experienced from an auto accident. Whiplash is a severe neck injury caused from the sudden stop of the vehicle. If auto accident injuries are not treated they can lead to chronic pain. Chiropractic care offers a safe, natural treatment for injuries cause by a car accident. As chiropractors, we understand many of our patients may be diagnosed with the same condition. Each person responds differently to care. For this reason, we tailor a specific treatment plan to meet each individual's particular needs, goals & unique health conditions. Finding a chiropractor who understands changing health care needs and the most current techniques and approaches to addressing health problems can be a daunting task. We hope you will find this site helpful in learning more about us and chiropractic. Contact us today or visit our Fayetteville, NC location if you have a back injury or neck injury! Don’t spend another minute in pain. Call 488-4477 Today! We Specialize in: Sprain and Strain Injuries, Injuries from Job related Accidents, Auto Accidents, Back Pain, Neck Pain, Pinched nerves, Sports Injuries, Disc injuries, Arm and Leg Pain, Headaches, Maternity and Pediatric Care.